I got a big, soft package in the mail from Sara's Texture Crafts, a British supplier of all sorts of spinning, knitting, and felting supplies. These fibers are for my fiber sampler project, which I'm spinning for Tour de Fleece. Included in my order are 50g each of the following breeds of sheep: Suffolk, Swaledale, Devon Longwool, Massam/Masham, Jacob, Wensleydale locks, Welsh Mountain, Merino, Superwash Merino, BFL, Cheviot, and Norwegian. 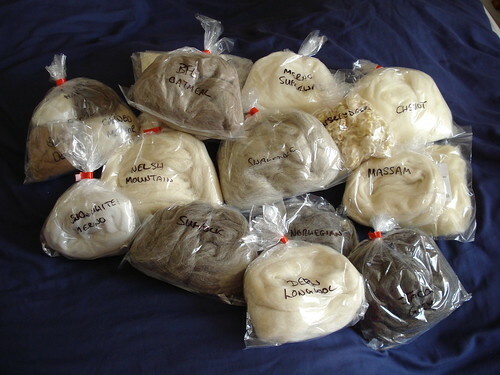 I also got two sample packs (the exotic fibers sampler and the silk sampler), containing 10g each of angora, mohair, alpaca, and yak, and tussah, bombyx, and mawata silk. I've ordered from Sara's Texture Crafts before, and I definitely would again. The shipping is super quick, the customer service is fantastic, and there's always a fantastic selection. Another big draw for me, for this project specifically, is that many of the fibers are sold in 50g quantities - just enough to sample. Other sites sell in multiples of 100g or even 200g, which is far too much for what I'm doing.